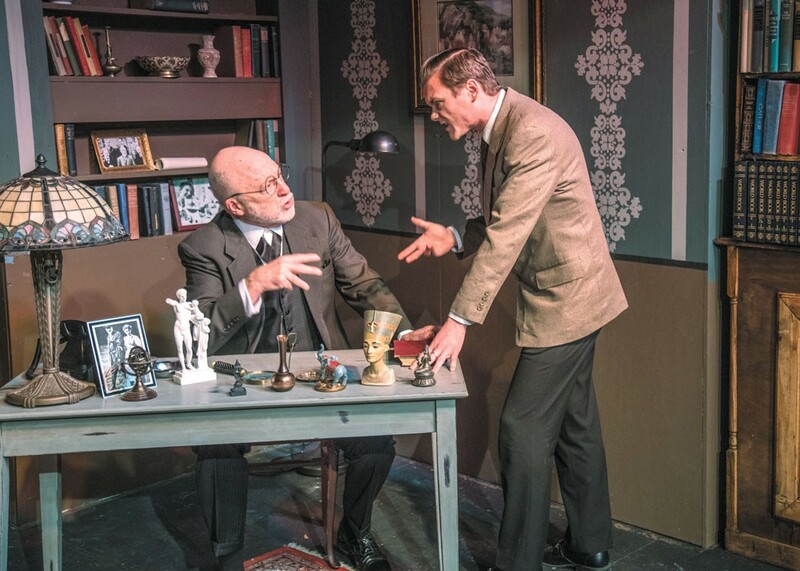 J.P. O'Shaughnessy as Sigmund Freud and Dalin Tipton as C.S. Lewis. The question of whether or not God exists is as old as the concept of God itself. And yet, much like love or injustice, it's a subject we never seem to exhaust no matter how many times it's taken up in song, poetry, prose, theater, visual art or film. Freud's Last Session, which opened last Friday at Stage Left as a replacement for the previously scheduled Galileo, pits two intellectual heavyweights against one another in the continued debate over God's existence. In this corner, Sigismund Schlomo Freud, the Headshrinker from Vienna, who maintains that theistic beliefs are just the result of atavistic unconscious desires. And in this corner, Clive Staples "Jack" Lewis, the Chronicler of Narnia himself, an erstwhile apostate who was persuaded to re-embrace Christianity by his colleague and fellow Inkling, none other than J.R.R. Tolkien. Mark St. Germain's 2009 off-Broadway play imagines Lewis and Freud meeting at the latter's home in London on Sept. 3, 1939, the day the United Kingdom and France officially declared war on Nazi-led Germany. Freud is 83, preeminent in his field, but dying of painful cancer of the mouth. Lewis is 40 and a respected Oxford don, though still years away from publishing his most enduring work. "The thing that I find most interesting about this fictitious meeting is the fact that Freud is at the end of his life," explains Pamela Kingsley, who's directing this three-weekend run of Freud's Last Session. "He's gone through the loss of several family members, a daughter that he loved very much, his grandson, and had to flee his beloved homeland because of Hitler. He's getting ready to die." As Freud contemplates his own mortality, he's compelled to debate this abiding metaphysical question with a sparring partner who's up to the task. So the famous exile invites Lewis to his study for an exercise that's more deathbed conversation than deathbed conversion. But why C.S. Lewis in particular? "Lewis had been an atheist and did a 180-degree flip and became a dogged Christian. Back then they called them 'Christian apologists,' and he would go out and stump for Christianity," Kingsley says. Even if Freud's personal circumstances weren't a factor, the play's setting on the eve of war would be enough to prompt philosophical and theological discussion along these same lines. The prospect of all-out global conflict just 20 years after the War to End All Wars led to serious reflection at the time and feeds into the conversation between the two. "There are air raids that go off. We hear Neville Chamberlain announcing that they're entering the war. We hear from King George. Throughout there's a BBC announcer. So the backdrop is a moment in history where a certain part of the world didn't know if they would survive, and there are moments when C.S. Lewis has to say, 'I don't know why God would do this.' And so the debate is very real." Given what audiences now know of World War II and its tragic legacy of genocide, mass brutality and nuclear destruction, the questions are perhaps even more poignant. At the same time, Kingsley says that "there's a lot of humor" in Freud's Last Session — with jokes being, as Freud himself argued, a way to say the unsayable. "That makes the really dramatic moments really sing," she says, as does the "intimacy" of Stage Left and the "chemistry" between actors J.P. O'Shaughnessy (Freud) and Dalin Tipton (Lewis). "What I was looking for was an old lion and a young lion who could go head to head," she says. "These two are actors who really can do it." Unlike the war that serves as its backdrop, however, Kingsley says that the emotional tête-à-tête in Freud's Last Session isn't about who wins.